This film got me thinking about the mid '90s and the time I spent living in Seattle / visiting Olympia, WA. I moved to the Northwest to find myself (gag) and discover what I was really made of when taken out of the comfort zone of where I grew up. I was originally from N.J. but when I was offered a job at C/Z Records in a shiny new city across the country, off I went. The extra absurd aspect of this move was that I remained in my East Coast band Dahlia Seed too. From 1994 to 1996 I was making trips back and forth between coasts to record and tour. It wasn't easy but this is how our band operated for years. Dahlia Seed had not yet toured nationally but it was my friend Michelle Noel who was instrumental in getting us a slot on the epic Yo Yo A Go Go Festival that took place in Olympia, WA in 1994. This performance was going to be our introduction to the left coast. In short, this show was a BIG DEAL. 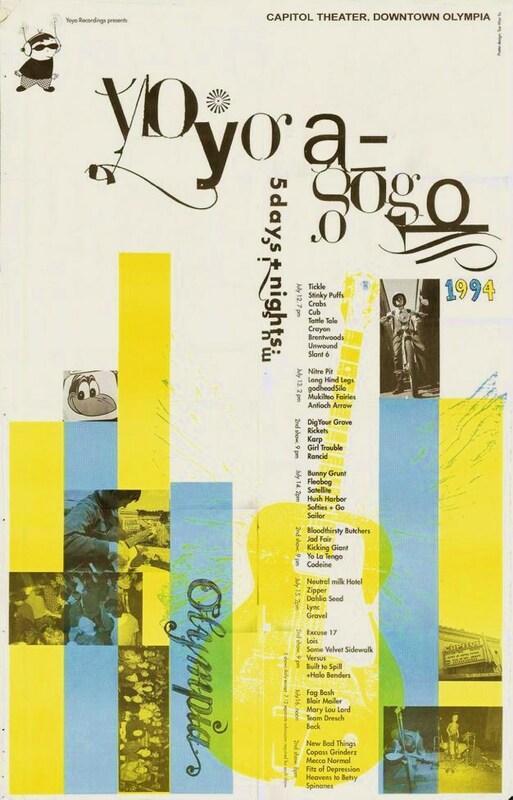 The plan was for the rest of the band to fly to Seattle and we would play Yo Yo together but it was foiled when circumstances led to the band not being able to afford the trip. So there we were with a once in a lifetime slot in an amazing fest but with only one member to play it, the singer, me. While I play guitar and sing, I am truly terrible at doing both at the same time (and a below average guitar player to boot) so playing this massive show solo was not an option for me. Last minute, I begged a friend who worked a C/Z with me to learn a few of the Dahlia Seed songs I had written and together we would perform a few of them as a two piece, he on guitar and me just singing. We practiced but nothing can really prepare you for the nerves that kick in when you play a massive show. Our day time slot was not nearly as packed as the nighttime shows but the venue holds up to 2500 people. So people or not, the theater is an intimidating and LARGE space. 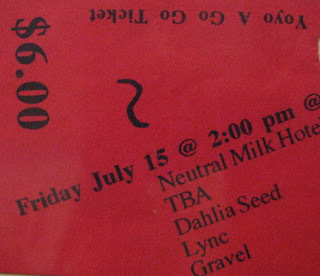 Dahlia Seed was a small DIY band that played to rooms with maybe, MAYBE a few hundred of people, so playing a show of this size was both exciting and terrifying for me. Not only because this was the biggest show I had ever played or the fact that I was so far from my home but because I was going to be performing without the comfort of my actual band. The bill says Dahlia Seed performed but this isn't 100% accurate. It was me and a tall drink of water who was willing to play guitar for me. Michael (whom I met when he joined the C/Z Records family as an intern) was such an amazing sport to learn a few songs written by people he didn't know and then perform them at for what I suspect was also the biggest show he has ever played in his life. We spent a few weeks meeting in his living room practicing unplugged the Dahlia Seed songs I knew how to play on guitar and trying to imagine how it all would sound in a giant space, electrified. We truthfully had no idea what we were in for. He was from Arizona, I was from New Jersey. We had zero context or experience to know what it was like to play the Capital Theater in Olympia. In an effort to win over the crowd (suspecting that we needed a little extra to help to win people over) we picked up a box of cookies from the Olympia Brewery. Fun fact : Olympia Beer made and sold cookies. 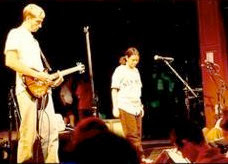 When we took the stage, we stood there for a minute in awe of it all (and me wearing a baseball jersey sent from Dahlia Seed guitar player Chris). Michael then as planned threw out cookies into the audience. Fun fact number 2 - Michael had such a great arm that he could wing cookies all the way back into the balcony. Fun Fact number 3 - bribing the audience with baked treats never hurts. You would think I would have a perfect memory of the biggest show I have ever played but honestly, I don't. The experience was so big, so overwhelming, that it all gets a little hazy after we stepped into the middle of the stage. I didn't really have the experience as a musician to handle the pressure of that moment confidently. We didn't have a total melt down but it wasn't a flawless performance either. Mistake were made. We were clumsy but we made through the whole set and enjoyed ourselves immensely. I would like to believe there was some sort of charm to our performance (hooray for cookies!) but I can't begin to guess what it was like to listen to or watch from a stranger's perspective. The crowd was kind to us. They clapped, made us feel welcome, and it was almost as if they seemed nervous for us. As awkward as it all was, it was an absolutely positive experience that I still can't believe I was a part of. And even more amazingly, thank you person I don't know for actually having a photo and placing in on the internet of what still remains the biggest show I have ever played in my life. Maybe not played perfectly, but dang it, I still played it! PS: We didn't make the cut on the music compilation of that year's fest but trust me, it was for the best.